Register now for Southern Illinois University Edwardsville Odyssey Science Camps being held from 9 a.m.-3:30 p.m. Monday-Friday, July 17-28. The SIUE STEM (science, technology, engineering and mathematics) Center offers seven different focus groups, designed for students entering grades 2-9. The camps provide children an opportunity to experience the excitement of science firsthand. Activities range from introducing scientific principles, building math skills, simple “crime scene” investigations, exploration of renewable energy sources, constructing a Lego® robot and astronomy activities, including telescope building and model rocket engineering. Registration costs for Odyssey Science Camps are $325, plus a $25 non-refundable application fee. A registration form is available at siue.edu/summer/camps. For more information, contact the STEM Center at 618-650-3065. 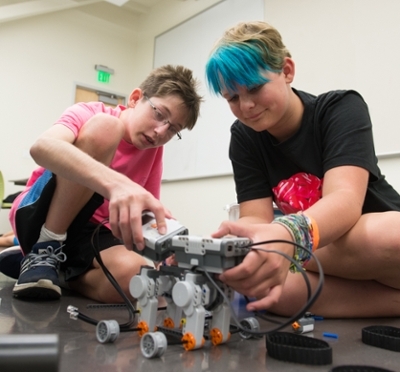 Photo: Montgomery Hubler (L) and Sydney Krueger (R) work on a robotics project during SIUE’s Odyssey Science Camp.